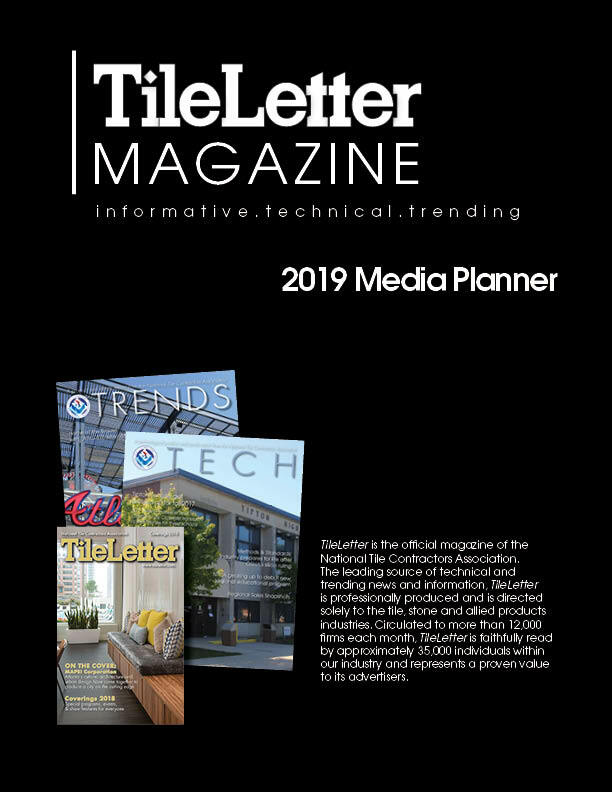 Click to download the 2019 TileLetter, TRENDS & TECH Media Planner. 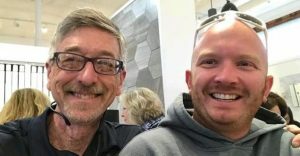 In 2003, Jeff Occhipinti, owner of Columbia River Tile & Stone in Portland, Ore. – and winner of the 2018 Coverings Installation Design Award for Residential Stone Installation – started working in the tile industry, learning from many stellar tile setters. 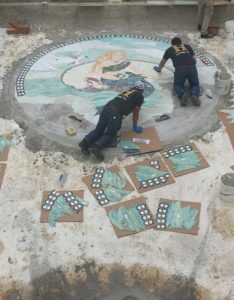 He developed a specialty in flagstone work, explaining, “It is challenging, but you can be very creative with it,” he said. 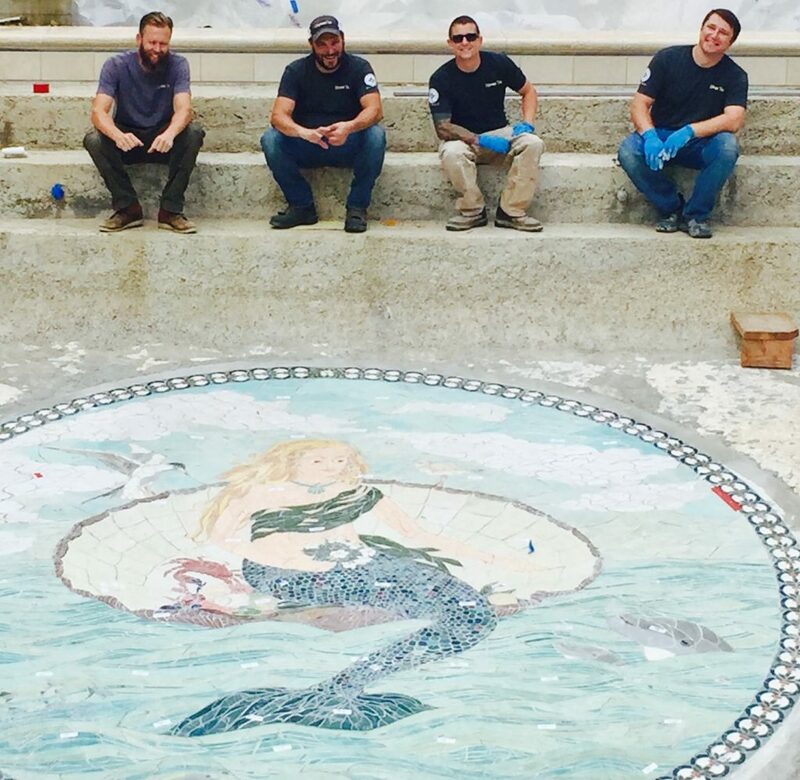 Columbia River Tile & Stone has grown to six employees including Occhipinti – all of whom have been hired with no previous construction experience. 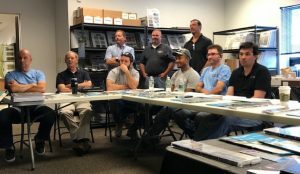 “We take pride in the fact that we are training the next generation of tile setters,” he said. “We believe heavily in education as we participate in local training events as well as being active in NTCA University. 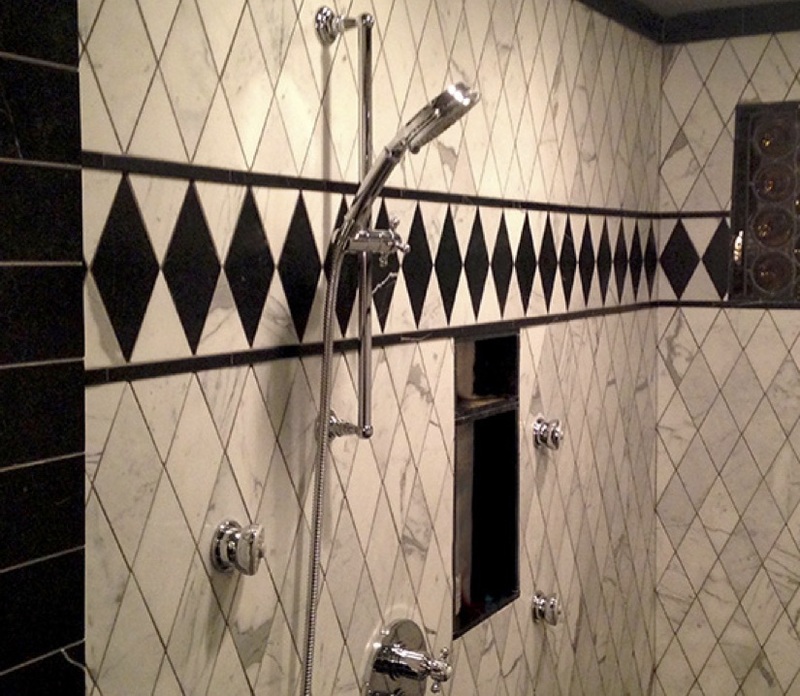 It is an exciting time right now in the tile industry. 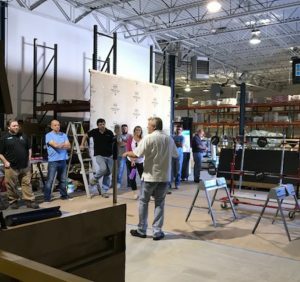 We are true artists and craftsmen in our work, and are proud to be contributing to the growth of the industry.” In fact, Columbia River Tile & Stone is a member of the newly formed Columbia-Oregon Tile Trades Training Trust, which starts its initial apprenticeship class next month (TileLetter July Training & Education feature). Occhipinti describes the installation process of his prizewinning project, for a previous client. “The homeowner unfortunately had a fire at their house that required a complete tear-down to the studs. This included the previous work that we had done. The homeowner had a vision for the rebuild of their 1929 home, and we were fortunate to be a part of that vision. 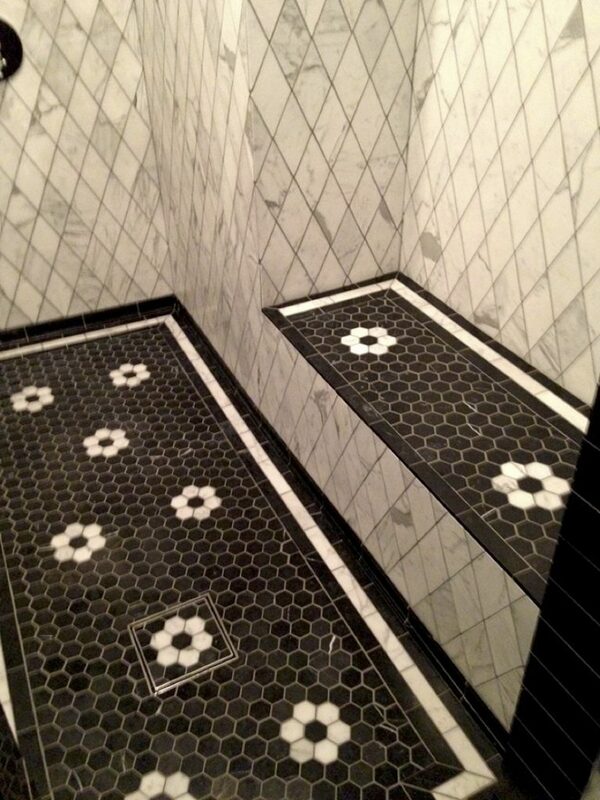 The upstairs bathroom had a tub surround with alternating diamond shaped Blue Celeste marble and White Thassos marble, the floor was 3” hex and borders of the same materials. 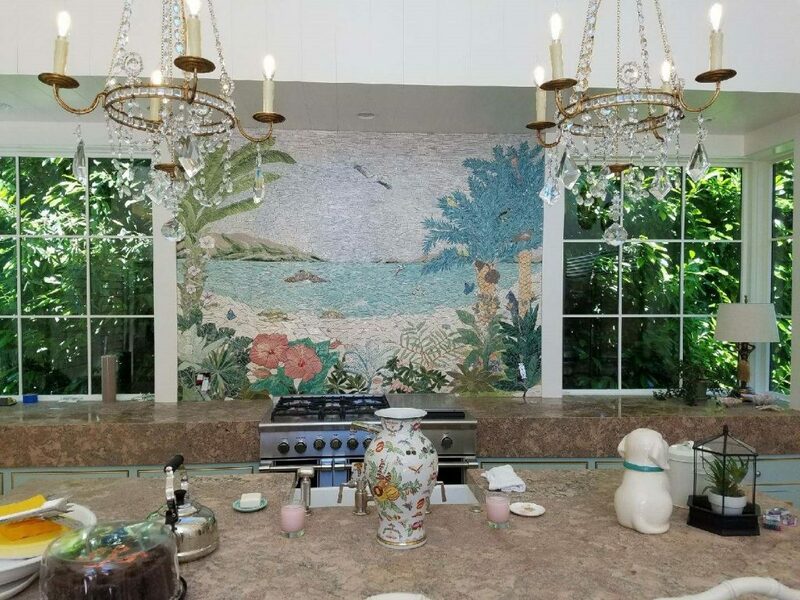 The kitchen floor, backsplash, and fireplace were Spanish style tile. For a vanity wall we installed a smoky mirror mosaic tile. “The master bathroom was the centerpiece of the project. 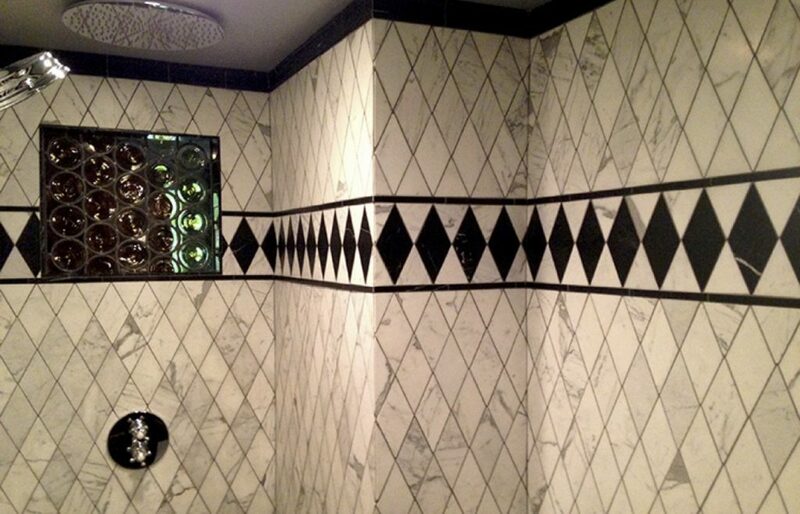 A combination of Nero Marquita and White Thassos marbles comprised the majority of the materials used. The concrete slab was recessed to accept the curb-less entry mud-set shower. 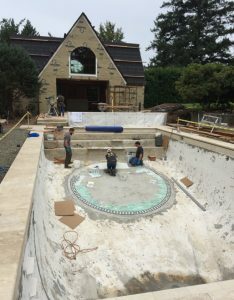 Everything was waterproofed with a liquid-applied, thin waterproofing anti-fracture membrane and the niche and bench were constructed out of wedi. The bathroom floor had Schluter Ditra underlayment and the bathroom floor and shower floor were both heated with SunTouch WarmWire. 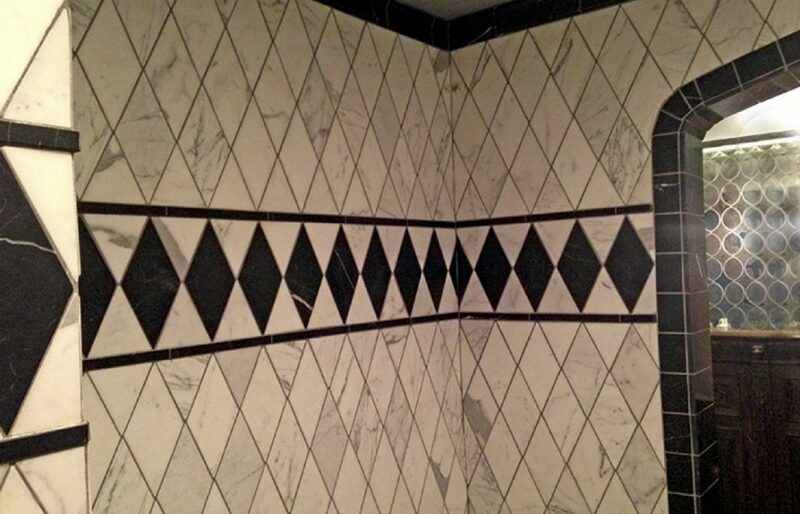 The job was finished with urethane grout and a penetrating sealer was applied to the marble. 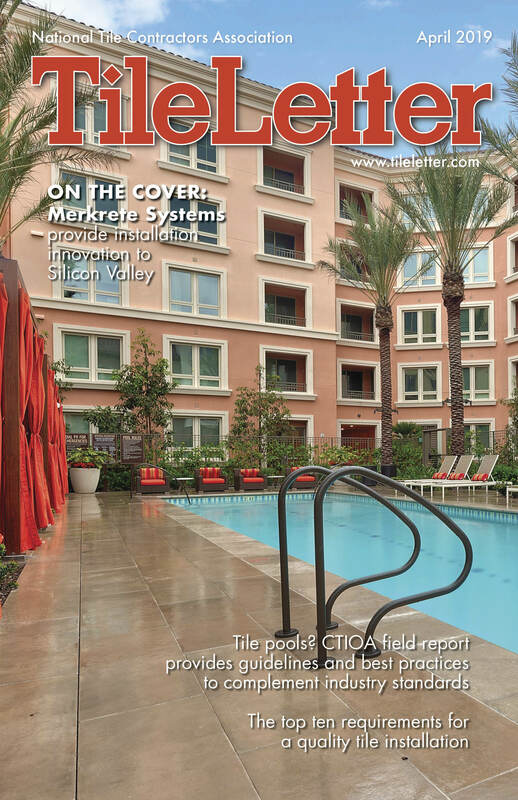 “Layout was critical on this project. We were able to continue the diamond pattern on six walls creating a true wrap-around effect. We were able to achieve full tile at all of the focal points including the bottom and top cuts, the vertical outside corner, and against the arched entry way. The stained glass window also has the pattern continue to the other side, in addition to having symmetrical cuts on both sides. The shower floor and bench top are centered and balanced. 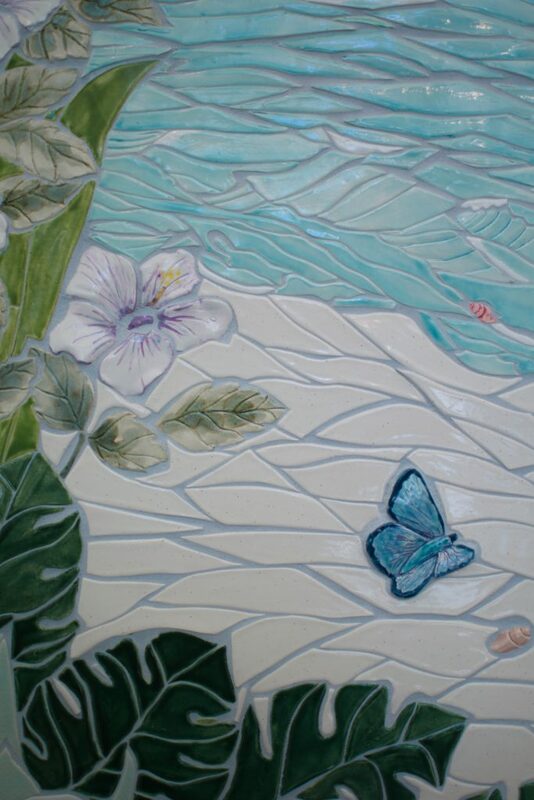 The floral patterns are also perfectly placed with one of the florals landing centered on the tiled shower drain. “This project definitely had its challenges. 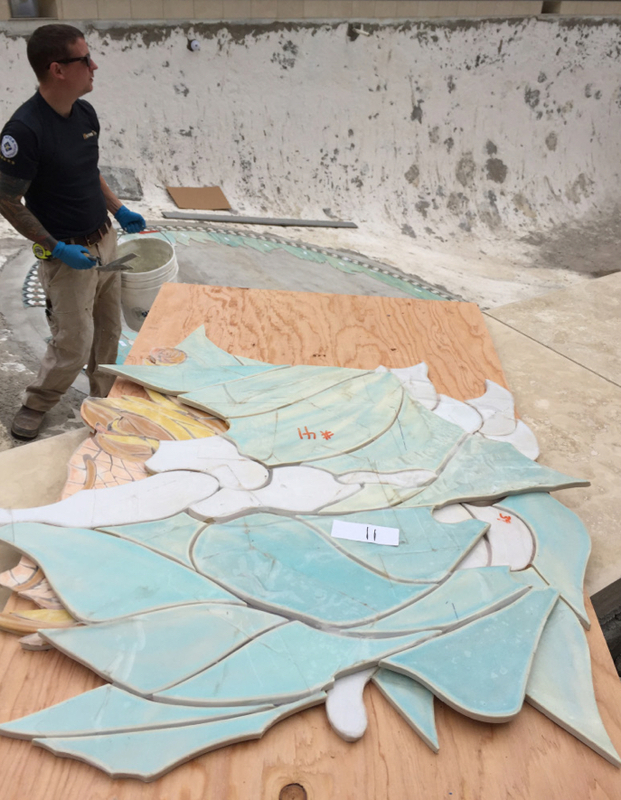 Right from the start we realized that stacking the diamond- shaped tile was going to require some special steps to keep the tile aligned properly. We modified our 1/16” T spacers to have a Y shape. This worked pretty well. The use of straight edges at the diagonal runs was crucial and helped keep the tiles from sliding out of alignment. The mitered outside edge also took some patience since White Thassos marble has a tendency to crumble when it is cut. There were quite a few attempts to get the perfect mitered edges for this focal corner. In addition to its inherent beauty, natural stone is globally acknowledged as the most time-honored and time-tested building material. Now easier to work with than ever before, durable and of course, a product of Mother Nature, it clearly stands up to the challenges of tomorrow. But realistically speaking, not all stone is alike. 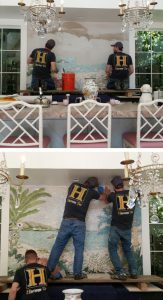 Because of that, to maintain, protect and regularly restore the “look” of natural stone, especially for indoor horizontal surfaces, certain regimens are absolutely necessary. Step one: is your stone acid resistant or acid-sensitive? Step one is to know if the stone’s characteristics include being acid-resistant or acid-sensitive. 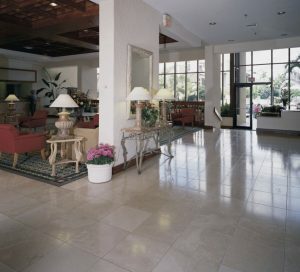 Should the stone surface be an acid-resistant stone such as natural granite, post-installation cleaning and maintenance procedures (provided the optimal products are used) should be less worrisome to end users than if they had recently installed acid-sensitive stone material such as travertine or limestone. 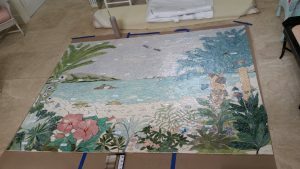 Often times, especially for commercial flooring installations where epoxy grout is specified, there is a great deal of grout haze/residue on the surface of the tile, even after the entire project has cured and cleaned. 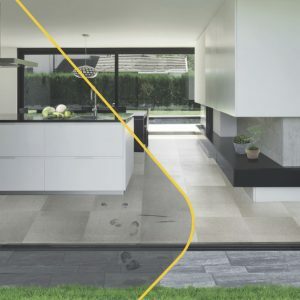 If the cleaning agent contains any acidic formulations, after the surface is cleaned, porous limestone and travertine will become impregnated with chemicals which over time, can become very destructive to the stone tile’s body. Cracking, breaking, efflorescence and even the emission of harmful VOCs possibly can result. It’s highly recommended to use a grout release product to thoroughly clean the surface of the flooring. In some cases, but not all, this process can actually be considered as sealing the stone material. 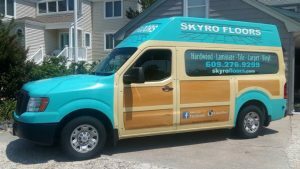 There are various educational programs and tutorials offering solutions from surface care professionals that clearly outline the best methods for post-installation stone floor treatments. Consider these as “insurance investments,” because if applied correctly, building owners don’t have to worry about down-the-road failures of their stone floor expenditures. Rather, they can be confident that their beautiful stone flooring will continue to perform and look great for years and years to come. But, there is a bit more to consider. After the stone flooring has been thoroughly installed, cleaned and sealed, a program should be discussed regarding ongoing protection and maintenance. One doesn’t have to be a rocket scientist to understand the need or simplicity of these regimens. But one does need to be a reasonable businessperson to recognize the fact that stone flooring, like every sizable investment, requires a certain amount of care to continue performing at optimal levels. Selection of protection, maintenance and sometimes, restoration materials is absolutely key. And again, step one is simply to know the composition of the stone materials that have been specified. For example, most people don’t realize that quartzite, which is a durable product of nature, can contain a certain degree of marble elements. Which surface care products to be selected should be dependent on knowing the percentage of that within the body of the quartz tile. Not to be confused with quartzite, quartz engineered stone tiles and slabs are agglomerates consisting of durable quartz chips held together by a binder of either cement or resin (epoxy). The surface care products you select should be determined by which kind of binder is used in the original manufacturing process. 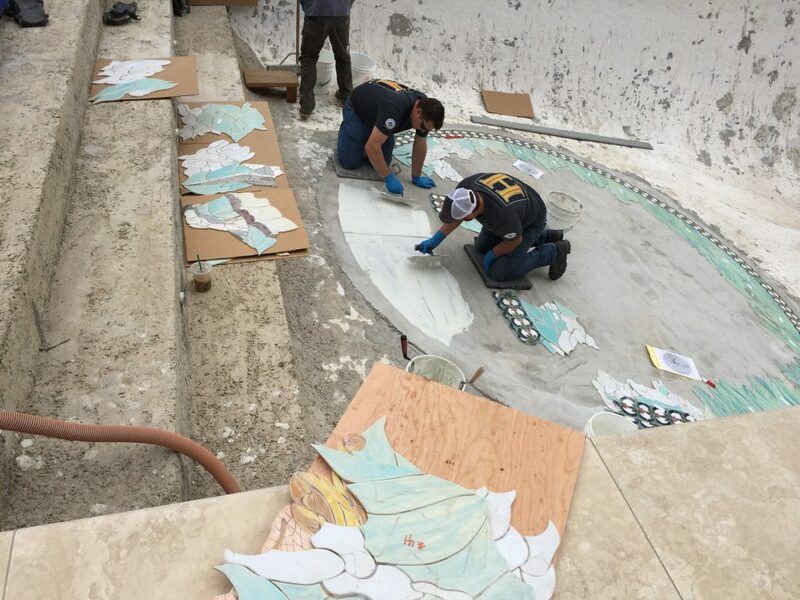 Obviously, cementitious materials are more porous and thus are subject to more staining than materials made with an epoxy resin binder. But whatever quartzite is being used, sealers, cleaners and other protectant chemicals produced with any concentration of alkalines should be avoided, as they can attack even the strongest of resin binders, ultimately causing deterioration. Not only is natural granite beautiful, it is one of the most durable natural stones offered by Mother Nature. But that doesn’t necessarily mean that just a regular program of wet-mopping will maintain its look. Even with grout joints so tiny that they look almost invisible, grouting between each individual tile needs to be regularly cleaned. And even granite material contains tiny pinholes and fissures into which contaminants may penetrate. To cut to the chase, the most hearty of granite material also needs a surface maintenance program to ensure its longevity in both aesthetics and performance. It’s obviously vitally important for buyers and specifiers to know the characteristics of ALL the stone flooring they are buying. And it’s just as important for them to know the characteristics of the surface care products needed to clean, protect and maintain these natural surfaces. Many of today’s surfacing materials produced for both the commercial and residential construction marketplaces can contain harmful substances. In spite of the global outcry relative to climatic change, they continue to be specified. Even building materials that claim to be recyclable can end up in a landfill. It’s time for you and your customers to acknowledge the need to consider more environmentally friendly building materials such as natural stone. And in doing so, to consider the best possible ways in which take care of this time-honored material. TTMAC provides online education, testing (ASTM C627, DCOF), on-site inspections, regional conferences, and an annual national convention. This year, the convention is being held in beautiful downtown Toronto, ON. 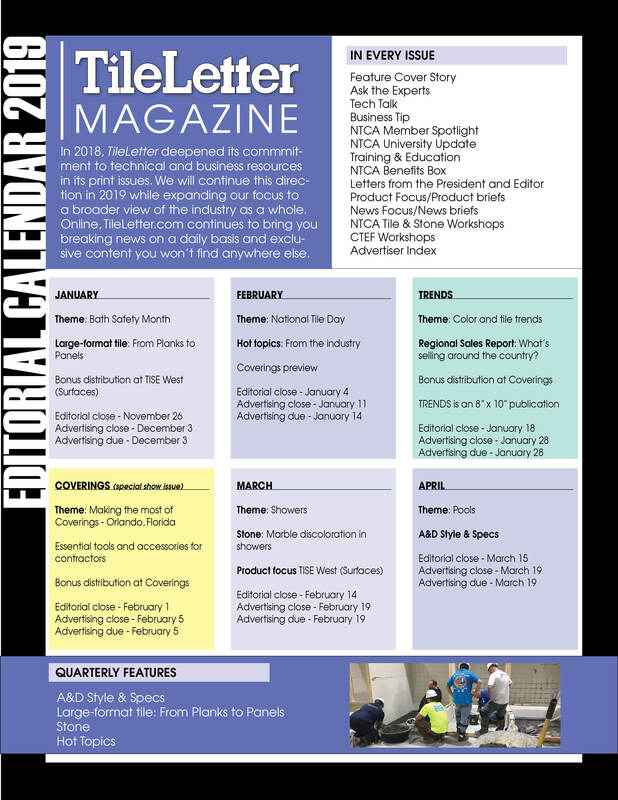 The TTMAC also produces several technical publications and for the first time this year it is proud to announce its newest addition, the new Tile Installer Technical Handbook. 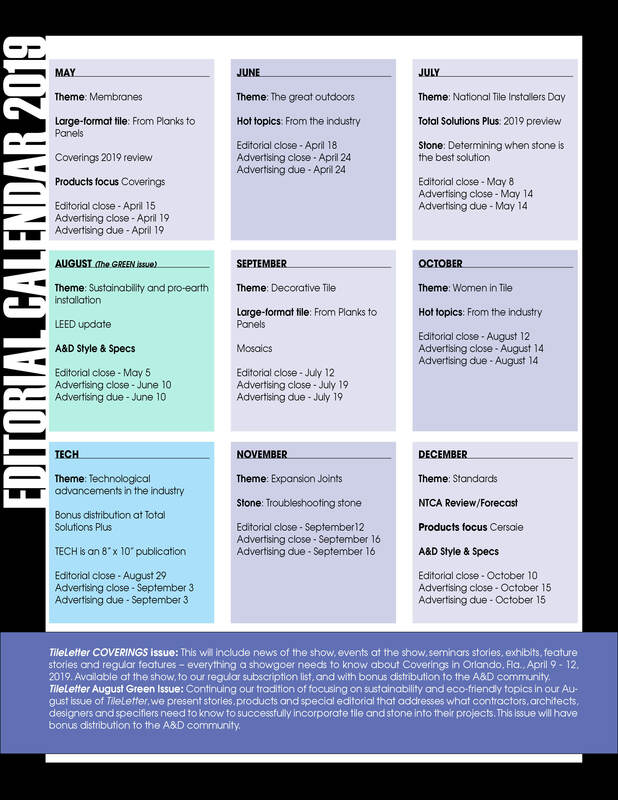 The Handbook, launched in July, was created to address specifically the challenges and predicaments that tile installers face on job sites almost daily. A large part of the content of this Handbook was reprinted under the permission of the National Tile Contractors Association (NTCA) located in Jackson, Miss., from the NTCA Reference Manual. All content was reviewed, modified, converted, and Canadianized, for the Great White North. This means that all the measurements are in metric, which was no small task, but for those of you who are still not that comfortable or familiar with metric, there’s a pretty comprehensive conversion chart in the back. Certain words had to be converted from American to Canadian such as vapor to vapour, color to colour, recognise to recognize, and uh huh to eh!!! All references to details in the TCNA Handbook have been converted to the appropriate details from the Canadian 09 30 00 Tile Installation Manual, as well as any relevant Canadian standards such as the Canadian National Building Code, CSA, CGSB, etc. 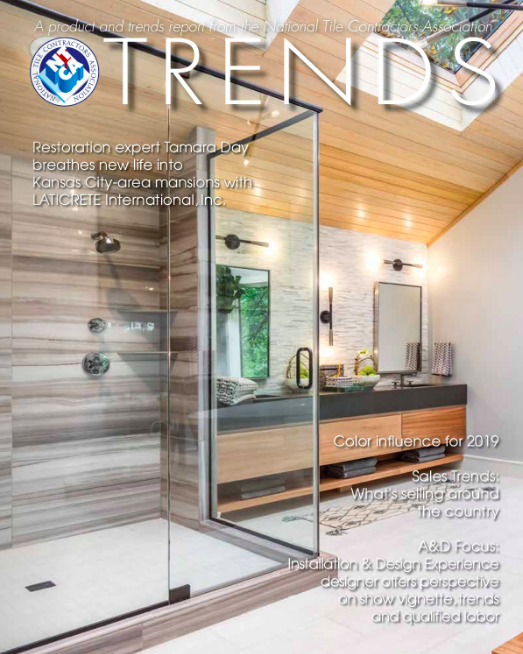 This Handbook has a wealth of information drawn from years of experience from tile contractors from coast to coast who have shared their lifetime of knowledge and expertise. Following a similar NTCA Reference Manual format, The Problem, the Cause, the Cure and Prevention in the Future is how the Handbook has been organized. In addition, when appropriate, a template with an informative letter is included after each topic. These letters can be used to inform customers what the issue is and what the appropriate solution may or may not be or what standard or code may or may not be met. General Care and Maintenance, and an extensive Glossary. In Canada there are of course some different challenges and construction methods, and as such this is where there are some major differences between the NTCA Reference Manual and the TTMAC Tile Installation Handbook. 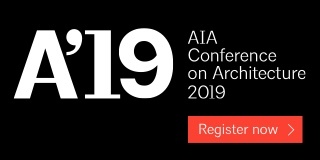 One such difference is with the recognition of the installation of Gauged Porcelain Tiles and Tile Panel/Slabs on wood substrates as identified in ANSI A108.19. In Canada, the minimum thickness by code for the subfloor is 15 mm (5/8”) thickness on 400 mm o.c. 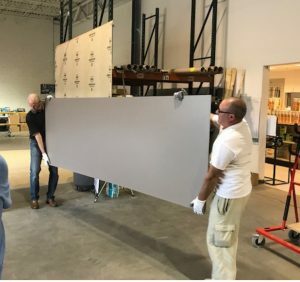 (16”) (not 20 mm (3/4”) as in the U.S.) so the use of these panels on wood substrates is not recommended, and will have to be researched and tested extensively by the TTMAC before it can be affirmed for the use over wood substrates. Other areas where there are some measurable differences between the US and Canada are: movement joint requirements, the use of partial coverage in crack-isolation membranes, back-buttering requirements, just to name a few. Unlike the TTMAC 09 03 00 Tile Installation Manual, which is designed and targeted for the architectural and specification community, the Tile Installer Technical Handbook was designed specifically for the end user, the grass roots of our industry: the “tile installer.” A large portion of the photos are from the TTMAC library and many are past recipients of the Hard Surface Awards. 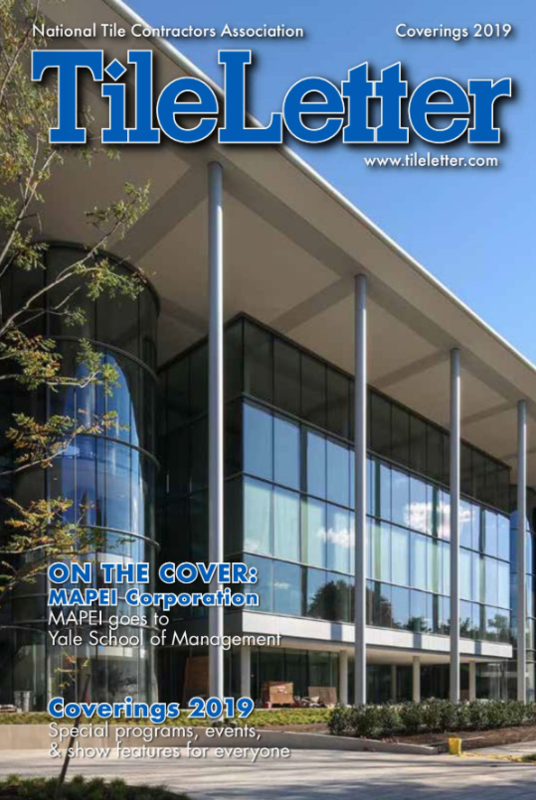 This new publication has 11 chapters and 306 pages of content. Since this is a relatively thick publication to print and to be environmentally responsible the TTMAC is also having this Tile Installer Technical Handbook available electronically. Lastly, the Tile Installer Technical Handbook is dated 2018-2019 and the goal of the TTMAC is to have it revised and reprinted approximately every two years, similar to the TTMAC 09 30 00 Tile Installation Manual. Canadian tile setters and other industry members can obtain a copy of the TTMAC Tile Installer Technical Handbook, by visiting https://ttmac.com/en/technical/specifications. The Handbook is available for both members and non-members at a nominal charge.